Heat dressing in large saucepan on medium-high heat. Add carrots, onions, yellow peppers and celery; cook 3 to 5 min. or until vegetables are crisp-tender, stirring occasionally. Stir in seasonings; cook and stir 1 min. Add broth, water, chickpeas and tomatoes. Bring to simmer; cover. Simmer on low heat 30 min. Remove soup from heat. Mash vegetables and beans slightly with potato masher. Stir in lemon juice and crushed pepper. 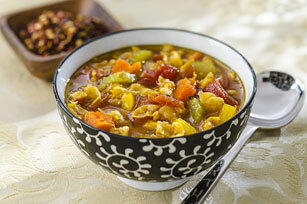 This soup would be equally delicious prepared with lentils or a mixture of chickpeas and lentils. You will get about 2 cups chickpeas from each rinsed can. For added colour and flavour, garnish each serving with chopped fresh parsley. This delicious soup is sure to become a new family favourite. And as a bonus, the colourful carrots and tomatoes team up to provide a good source of vitamin A.